Here, I wanted to make a simple bowl that had a contemporary twist. I decided to use birch plywood as it is a modern, contemporary material in comparison to the standard woods I use. Plywood is a very versatile material. As well as being very stable in use it can be cut, carved, turned, moulded, laminated with other materials, stained and painted - to name just a few processes. While not new to turning, plywood can add a different perspective to the way that we normally work, and it opens up many possibilities for new design ideas. There are various grades of plywood made for different applications. Here, I am using birch throughout ply, which is made from sheets of birch sandwiched together with alternating grain directions and resin to produce a product, which in this case, is used for kitchen cabinet carcasses. Birch ply is available in 8 x 4ft sheets at around £45 per sheet. However, the number of pieces that can be made from one sheet makes it a cost-effective material. One negative of using any plywood for turning is that the resins used to glue it together are very abrasive to cutting tools. 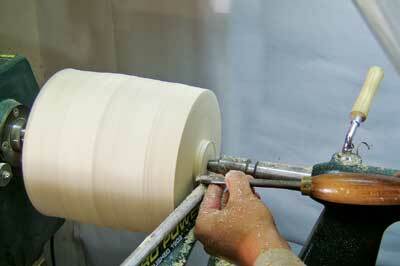 This means that regular sharpening is required in order to obtain an efficient cutting action and finish. However, this, for me, is outweighed by the interesting effects that can be achieved. Before we can turn the ply, it is necessary to glue up a suitable block for the project. This obviously varies from project to project - see the cutting list/diagram for the specific requirements. Here are some basic rules that should be applied for a successful outcome. The first is to always use good quality wood glue. Poor quality/cheap glues may not hold the laminated parts together when turned, resulting in possible damage to the project or injury to the maker. For this project, I chose to use UniBond's No More Nails as it is very strong when cured. Once the ply has been processed to the required sizes, you then need to remove all the rough edges using 120 grit abrasive. Check the faces of each part for blemishes and sand flat, if required. 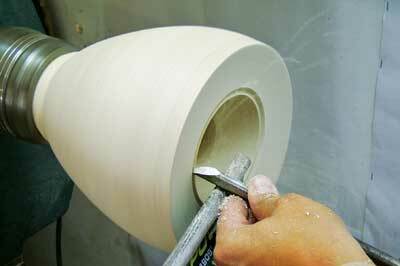 If good quality ply is used then this process should be minimal, if needed at all. 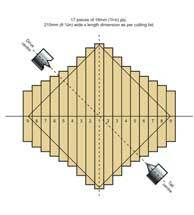 Cut the ply â€“ as per the diagram â€“ to produce a block measuring 210 x 200mm. The extra 10mm needs to be left for the chuck spigot. If you have a smaller saw then the components can be proportionally reduced to fit. Glue all the parts together then clamp and leave overnight for the glue to thoroughly set. Draw a 200mm square on the edges of the ply block so that the direction of the ply runs through the block, as per the diagram. Cut this out on the bandsaw to remove the waste. 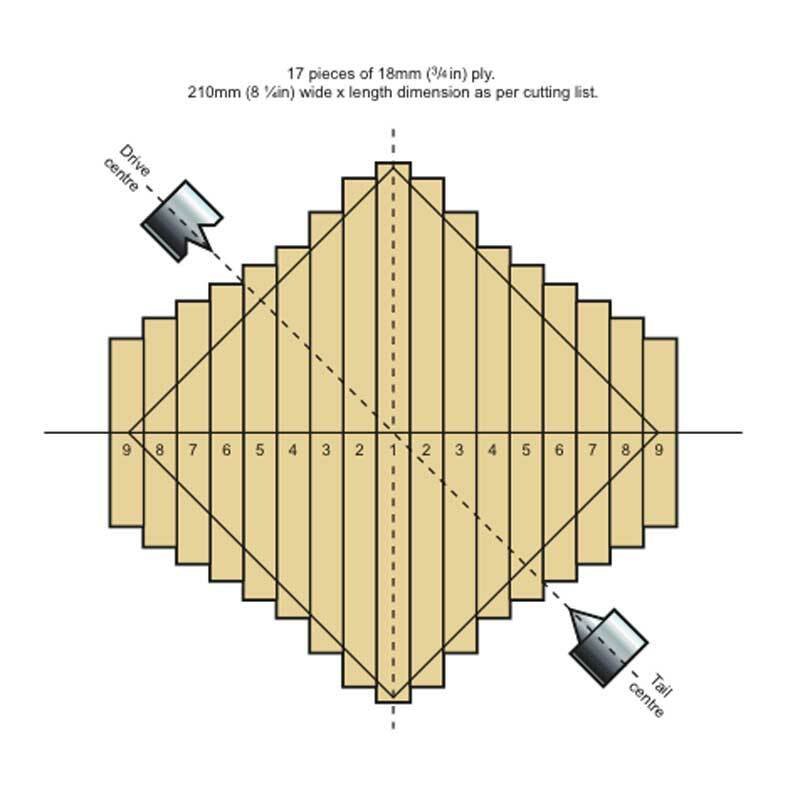 Rotate the block so the face of the ply is facing upward and draw a 200mm circle centrally onto this face and cut the corners from this for an octagon, or cut the blank to a circle, if you prefer. 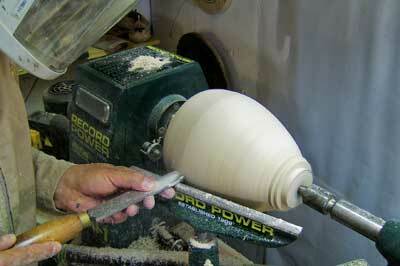 Then place the blank between centres with the ply running diagonally to the axis of the lathe. This gives a more interesting effect than a horizontal or vertically orientated ply direction. 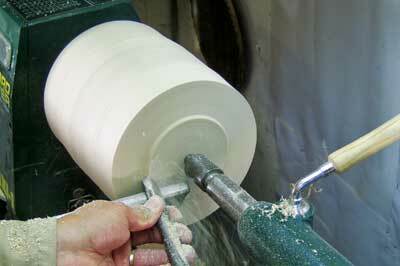 Place the blank between centres and use a 12mm bowl gouge to rough down the outside to the round. You can, if you prefer, cut the corners of the blank away safely to make an octagon shape, but this is not essential. 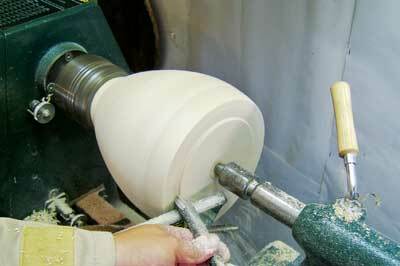 Clean up the front face using a 12mm bowl gouge, working from the outside in towards the tailcentre. 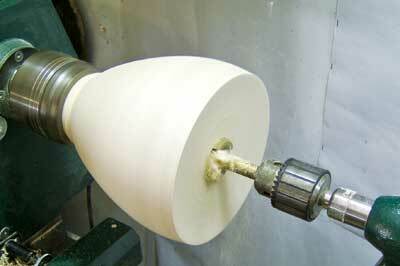 Mark the diameter for the spigot on the base and remove the main material up to this line, using a 12mm bowl gouge. Profile the spigot as necessary with a 12mm skew placed horizontally on the toolrest in a trailing mode. 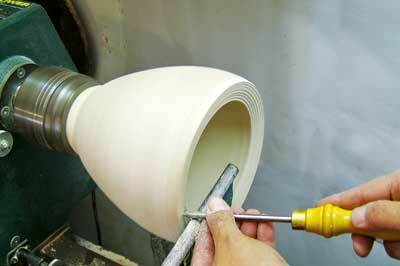 Produce the main profile using a 12mm bowl gouge, working down towards the tailcentre. Use a 25mm scraper in trailing mode to gently clean up any tool marks. Here I am using a negative-rake scraper, but a standard scraper will do. 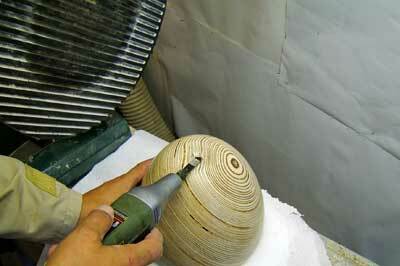 Due to cutting mostly end grain fibres within the ply, you will need to take very gentle cuts or tear-out will occur. If this is the case, return to a sharp gouge and take fine cuts. Leave the scraping process and go straight to finishing with abrasive. If any voids are revealed within the ply, as in the first photo, then take some of the fine shavings and rub them into the void. Drip high viscosity Cyanoacrylate adhesive into this and immediately rub over the area with 120 grit abrasive. This will produce fine dust which will fill the void. Reverse the blank into the chuck and bring up the revolving tailcentre into the hole left by the drive centre. 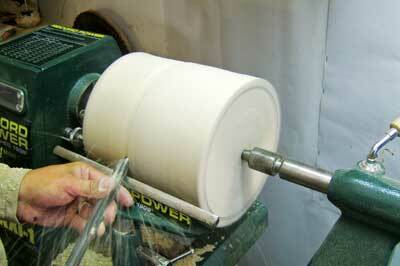 Clean up the front face to a safe distance from the centre using a 12mm bowl gouge. To reduce the amount of wear on the gouge, and to aid material removal, drill out the centre of the bowl to a depth of 65mm using a 50mm Forstner bit. 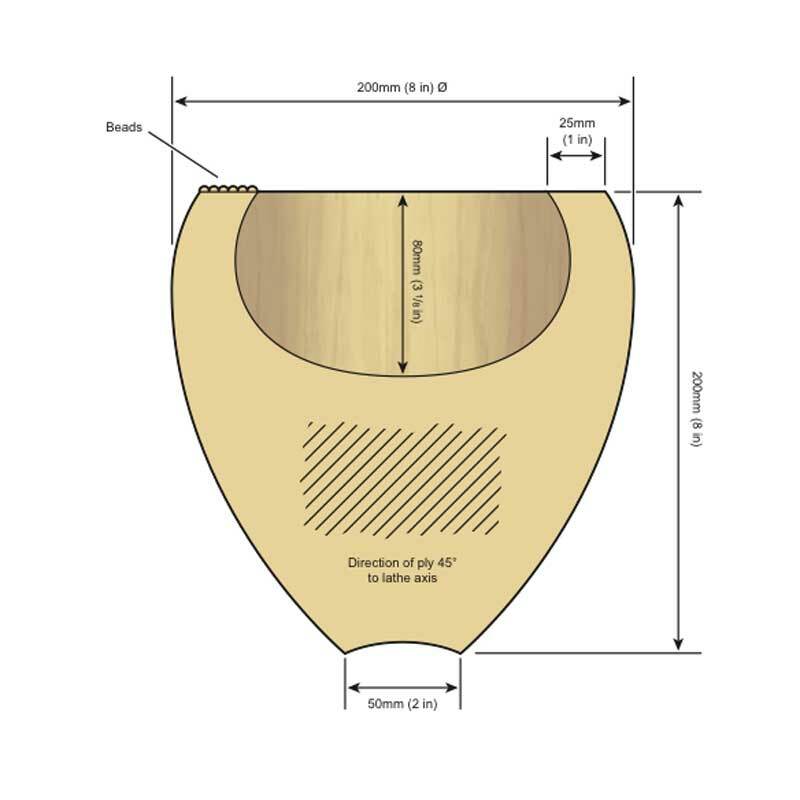 Using a 10mm bowl gouge, profile the inside of the bowl so you are under-cutting the rim, whilst making sure that the hole left by the spur of the drill has been removed. Using a 6mm point tool, produce beads on the top of the rim. 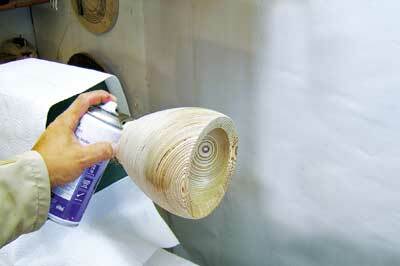 Finish the outside and inside of the bowl using abrasive from 120-400 grit. Finish the beads to the same grit by hand, folding the abrasive in half - this will allow you to get into the base of the beads. 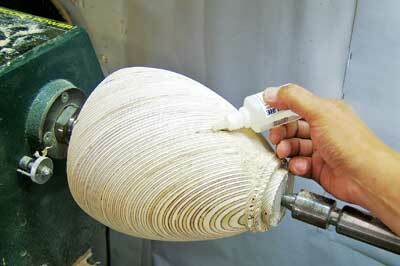 Protect the lathe using kitchen towel and apply acrylic sealer. 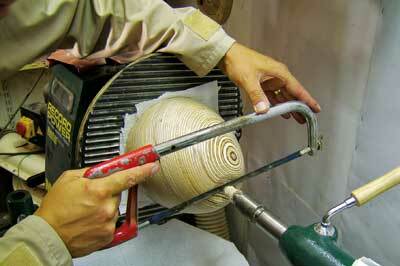 Allow to dry then cut back with wire wool with the lathe running at around 300rpm. Apply several coats of acrylic satin lacquer, again, cutting back between coats when dry. Apply one final topcoat to finish. The sealer and lacquer need only to be applied halfway down the outside of the form, as the lower part of the profile will be finished during the next stage. Reverse the bowl onto a friction drive and bring up the tailcentre. 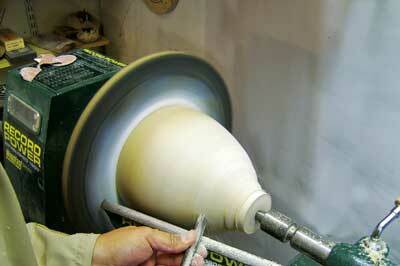 Refine the lower profile of the bowl using a 10mm bowl gouge. 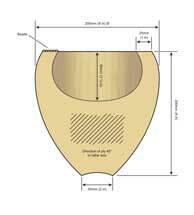 Reduce the waste section of the spigot and slightly concave the base profile of the bowl leaving around a 10mm diameter of material. Reducing the waste material more than this could result in the tailcentre pressure splitting the laminate apart. 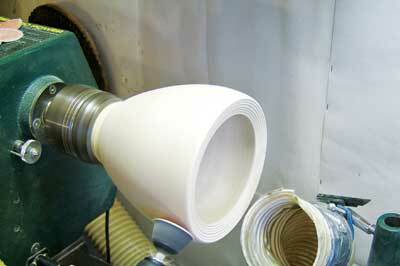 Finish the base as before, using abrasive from 120-400 grit. 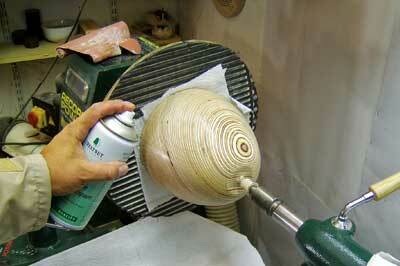 Once complete, protect the lathe with kitchen towel and apply the acrylic sanding sealer. Repeat the cutting back process with wire wool and finally apply the acrylic satin lacquer, as before. Remove the waste material using a fine blade saw. 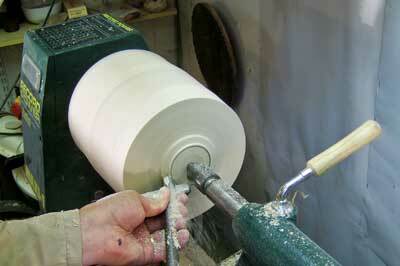 Be careful not to cut all the way through or the bowl will fall off the lathe. Clean up the base using a power carver or sharp chisel. Finish with 120-400 grit abrasive. Apply acrylic sanding sealer and lacquer as before. 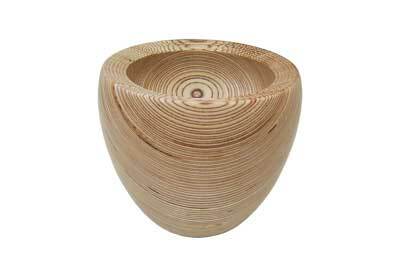 The contemporary birch plywood bowl is now complete. 2. Preparation is the key, so leave enough time for the blank to be left during clamping to ensure adequate curing of the glue. Always read the manufacturer instructions in relation to this. 3. Alternate layers of contrasting wood or acrylic can be glued between the sheets of ply to add interest. 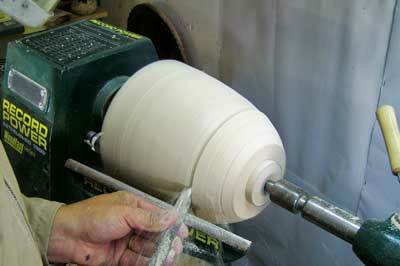 This is also a good way of developing your turning skills. 4. If you want to stain the ply then you need to do this before the sanding sealer is applied. 5. 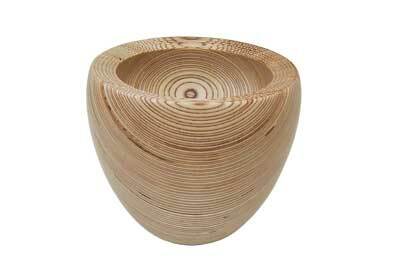 For much larger bowls, why not save material by cutting out donut shaped pieces of ply for the upper area of the form? 6. Birch-faced ply offers a great way of being able to build up small or large blanks, inexpensively. You can control the direction of the grain and whether to insert solid timber, acrylics etc. The primary construction method, i.e. gluing up, is fundamental to success. If the glues fail, I will leave you to imagine the outcome. So, good quality glue applied to clean surfaces, which is then clamped and left to dry properly before turning, is an absolute must.